34067 Tangmere, 1Z88, London Victoria, Fri 14 May 2004 1 - 0900. The gleaming Battle of Britain Pacific awaits departure with a charter run by the Rly Touring Co to commemomorate the 75th anniversary of the inaguration in 1929 of the Golden Arrow / Fleche d'Or between London and Paris. The service initally only catered for Pullman passengers. They travelled in different trains in England and France, crossing the English Channel by steamer as foot passengers. 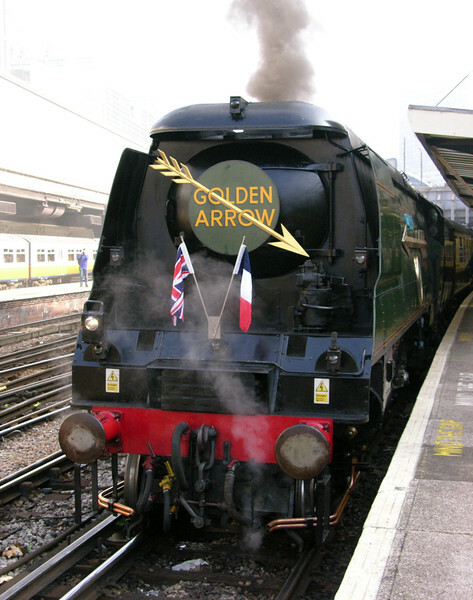 The Golden Arrow left Victoria at 1100, and the Fleche d'Or reached Paris at 1735. A separate service carried ordinary first and second class passengers until 1931, when they were admitted to the Golden Arrow. By the Second World War it usually comprised four Pullmans, six ordinary carriages and two vans for luggage. Immediately after the war the Arrow once again became an all-Pullman train with ten Pullman cars and two vans. But once again, Pullman traffic fell off and second class passengers were admitted. The Golden Arrow was withdrawn in 1972, by which time it carried only four Pullman cars and was slower than it had been in 1929.